Prior to yesterday’s game between the Saint Louis Rams and the Oakland Raiders, several Rams offensive players entered the stadium with their hands up, mimicking the stance that some witnesses claim #MichaelBrown adopted prior to being fatally shot by Officer Darren Wilson. This morning, Joe Scarborough of “Morning Joe” was on a rant. He questioned how the Saint Louis Rams ( by implication, anyone) would choose to make a hero out of #Michael Brown who was clearly a “thug.” It seems to me that #MichaelBrown would have needed to be arrested, charged with a crime and convicted before one could say, with any authority, that #MichaelBrown was a “thug.” Officer Wilson denied #MichaelBrown the right of a fair trial, so the world will never know if #MichaelBrown would have been found guilty of robbing a store and assaulting a police officer. #MichaelBrown’s side of the story has been forever silenced. 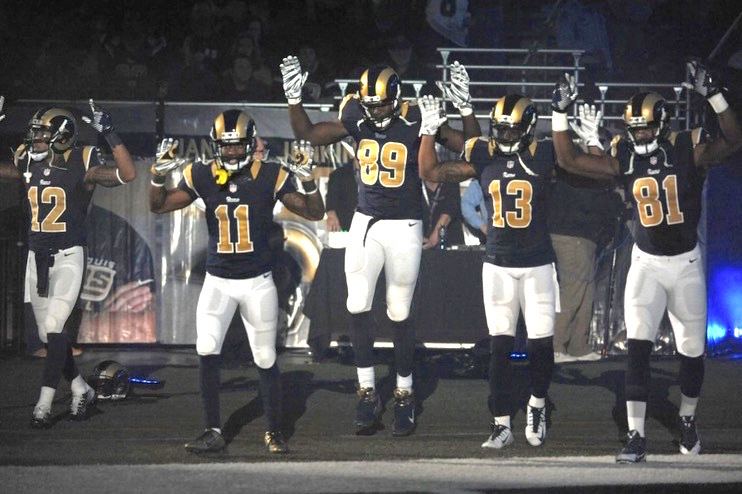 One cannot say that the Rams football players did or did not come onto the field with #Handsup because they saw #MichaelBrown as a hero. Perhaps, they simply saw a black teenager denied due process under the law. Although I am not a lawyer, it is my understanding that even hardened criminals, in this country, should be accorded certain rights and protections. Joe Scarborough ended his rant by saying that while most people will not say it publicly, 95% of people agree with him. I’m tempted to use my mother’s words — “if 95% of the people jumped off a bridge would you join them”? –but I won’t. Instead, I will say that things often look different from a distance. In 1967 Muhammad Ali opposed the Vietnam War and refused to be inducted into the United States Army on religious grounds. Muhammad Ali claimed a religious exemption because he is a Muslim. Ali was initially convicted of draft evasion, sentenced to prison, fined and banned from boxing. I would venture to say that 98% of Americans (including many in the largely Christian African-American population) agreed with the government’s harsh treatment of Ali. After all, he was not a Christian. He was not even a Quaker. So, who was he to refuse to serve in the military? However, after reviewing the cascade of body bags, the dark days of anti-war protests (especially, the Kent State Massacre), and, finally, the Pentagon Papers; public opinions changed, as did government policy. I think Joe Scarborough would be hard-pressed to find anyone, looking back, who does not respect Ali for acting according to his conscience. At the 1968 Summer Olympics in Mexico, two Black American Olympic medalists, Tommie Smith and John Carlos, stood on a podium, bowed their heads and raised their fists in the air, giving the Black Power salute during the playing of the National Anthen. This gesture of solidarity with Black Americans who were fighting for equality back home in the United States cost these athletes dearly. Millions of white Americans were offended by this act. These two athletes could have followed the example of the great Jesse Owens, who won four gold medals at the 1936 Summer Olympics in Berlin, Germany and greatly offended, I’m sure, Adolph Hitler by doing so. Jesse Owens made no outward sign or gesture to show how he felt about racism or the fact that Blacks and Jews were treated differently (i.e., Hitler sought to exclude them from the games). Jesse Owens’ only response to Hitler’s claim of Aryan supremacy was to debunk the theory of Aryan superiority on the track. Reportedly, Jesse Owens did not receive the same congratulations from President Roosevelt as was accorded other American athletes returning home from the Olympics. Still, there is no record of Owens acting to draw attention to the his reality. It seems to me that the times dictate ones response to perceived racism. Tommie Smith and John Carlos chose to bow their heads in acknowledgement of the Star Spangled Banner, while raising their fists in the popular Black Power Salute. They knew Jesse Owens. They must have known the racism he encountered. They certainly must have experienced racism in their own lives and understood the struggles of Black Americans who were not standing there with them on the podium. As a young college student in 1968, I appreciated the internal struggles that Smith and Carlos must have experienced — wanting to support the struggle for racial equality at home while pursuing their quest for the gold. They did not burn any buildings or commit any crimes, but they gave us a sign that we recognized. Their fists let us know that they cared. It seems to me that the Saint Louis Rams players are standing on broad shoulders. Joe Scarborough and 95% of his viewers may be offended. This is not the first time that a lot of people were offended. It will not be the last. The majority can be wrong. One’s conscience cannot be dictated by majority vote. An act of conscience must be the result of one’s moral compass. Others may not understand until they look back from a distance. Reblogged this on Straight Talk. he meant 95% of white people who in his mind make up all of America. He would be hard pressed to find 95% of African Americans who feel as if he does. Mike Brown is not a hero but he deserved more than what he got over a few damn cigars and he wasn’t stopped for being a thug he was stopped for walking in the middle of the street.